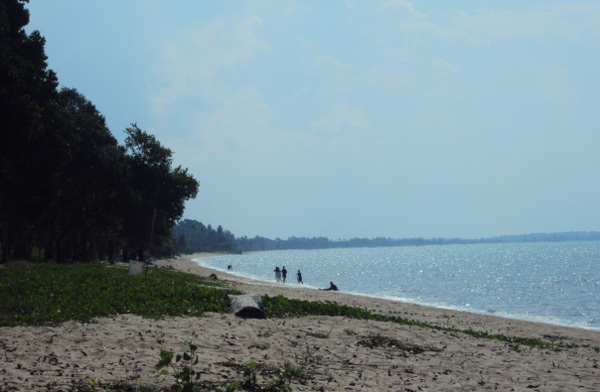 In Koba District, Bangka Island, there is a perfect beach for relaxation. The name is Arung Dalam Beach. It belongs to Central Bangka Regency. What is special about it? People come there to enjoy a spectacular sunset. It is a romantic place to spend an afternoon with the special one. The sound of waves and soothing wind also create a perfect atmosphere there. During weekends, you may expect lots of people in the beach. These include youngsters, families, tourists, and much more. Everyone loves it! The most attractive feature in Arung Dalam Beach is its stunning sunset. The sky emits orange color and beautiful atmosphere. When it comes to the waves, they are calm and small. The shoreline is narrow but comfortable. In the horizon, you may find green and tall trees. The sand is white and comfortable, so it is perfect for relaxation. In the weekends, people in Koba often come to the beach. They want to spend a romantic afternoon either with friends or families. The best thing is accessibility. Everyone can reach Arung Dalam Beach without hassles. Most of the visitors come from Pangkal Pinang City. They come to the beach to enjoy pure nature and to relax. What about you? Such tourist spot never fails to astonish visitors. In the afternoon, there is a perfect sunset. If you at the right time, you won’t miss such natural phenomenon. You don’t even need to carry refreshments. Some food and beverage vendors are available in several parts of the beach! Arung Dalam Beach is crowded during weekends. You may expect lots of young people. They come with friends and chat freely. The next attraction is a formation of coconut trees. These create a comfortable mood. Thus, you can relax while drinking a fresh coconut drink. While relaxing, you may hear the splash of the waves. It is quite mesmerizing. You don’t have to come with friends or families. The beach accommodates a single traveler, as well. It is an opportunity to self-reflection and to find peace. Another popular activity is photography. The beach is suitable for both amateur and professional photographers. Due to this reason, you should carry a camera. You can take pictures of numerous beautiful objects in Arung Dalam Beach. These include coconut trees, waves, tourists, sunset, and much more. You don’t have to be a good photographer. With those superb objects, everyone can take valuable photographs. That is for sure. Also, the result is better if you carry a good-quality camera. Arung Dalam Beach belongs to South Bangka Regency. You should head to Koba District first. The beach is easy to reach regardless of your location. Though, most of the visitors come from Pangkal Pinang City. The trip takes approximately 1 hour and 10 minutes. The distance is 54.2 km. The first route is Pangkal Pinang – Namang Street. Next, you must take Namang – Koba Street. It is the fastest route to reach Arung Dalam.